-Put peeled and cut potatoes into a saucepan and cover with cold water, bring to boil for about 7 or 8 minutes, just until ‘parboiled’. (Go to step 2 while this is happening). Don’t cook them all the way through. Drain the water off and allow to cool for a little so you can pick them up without burning yourself. -Preheat oven to 200 degrees Celsius. Prepare an oven tray with baking paper. In a bowl, place garlic, lemon juice, salt, oregano and oil. -When potatoes are cool enough to handle, use a fork to make some grooves in their flesh. Then add potatoes into seasoned liquid and with your hands, bathe potatoes in mixture until fully coated. 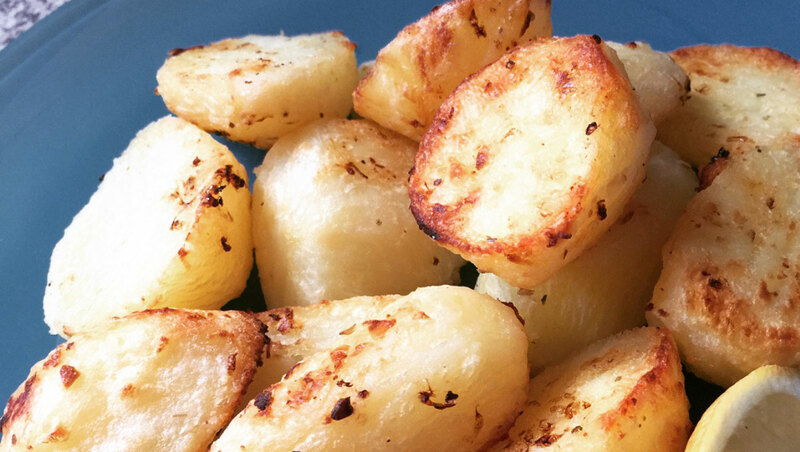 -Evenly space potatoes on oven tray and bake in oven until golden brown and crispy, approximately 20 minutes. Alternatively, brown on a hot BBQ plate, being careful when turning, so as not to crush potatoes. Serve with a Greek salad and/or haloumi and/or meat, like lamb.